For nearly all entity types, you can view related results and analytics by opening a record and then switching to the Insights tab. Some Insights tabs include two or more categories of insights. You can navigate between these categories by using the vertical navigator at the side of the page. Use the Menu button at the top of the tab to open or close the navigator. At the top of most insights tabs, you'll find settings that let you filter the information shown—for example, by date ( From and To settings) or usage (such as which Customer journey an email was used in). When you're reviewing your insights, you'll see graphs, timelines, and values for a wide variety of results, interactions, and key performance indicators (KPIs). To learn more about what each display is telling you, hover your mouse pointer near the value you're interested in until the info icon appears, then hover on this icon to view a tool tip with a description of that value. For more information about many of the most-used insights and how they are calculated, see the Insights glossary. Many of the tool tips also reference this glossary. To view contact insights, go to Marketing > Customers > Contacts, select a contact record, and then open its Insights tab. Here you can find a complete history of how your selected contact has interacted with your marketing initiatives. This can help you to understand what this specific contact is interested in and which types of messages they respond to. Marketers might use this information to get deeper knowledge about specific decision makers so they can better target future initiatives, while salespeople might use this to find out how best to talk to this person should they choose to contact them directly. Overview: View a timeline of all interactions the contact has made and a chart of interactions broken down by type. Email interactions: View complete details of email results for the selected contact, including a list of all messages sent to them, plus lists of all opens, clicks, bounces, and more. Web interactions: See which pages and links from your websites and marketing pages the contact has opened, and which links they selected. Also lists each redirect URL this contact has clicked on. 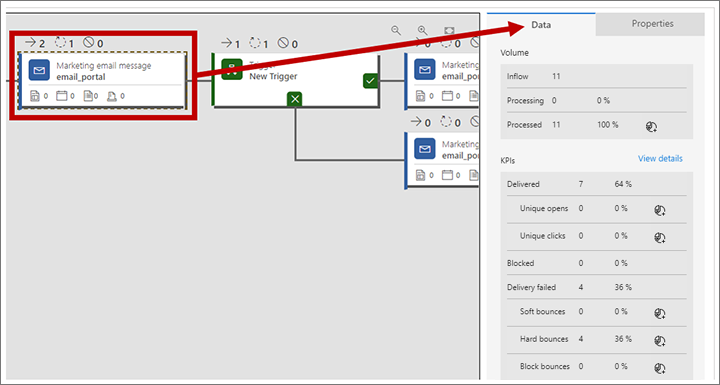 Only pages that include a Dynamics 365 for Marketing tracking script are counted here. The Websites visited list shows all tracked pages that were visited by this known contact. The Websites clicked list shows all of the links this user clicked on when viewing a tracked page. Each visited link is show as a full URL, and repeat visits are listed just once, with a counter. If you embed a marketing form into an external webpage, then a tracking tag is included and visits to that page are therefore shown here. Results from anonymous visits and redirect-URL clicks that occurred prior to becoming a known contact are not shown here. Event interactions: See a timeline of event interactions, and event registration, check-in and cancellation records for the current contact. Marketing form interactions: See which marketing forms the contact has submitted and the content of each submission. Subscription list interactions: See which subscription lists the contact joined or left, and when. To view lead insights, go to Marketing > Customers > Leads, select a lead record, and then open its Insights tab. Most of the insights displayed for a lead are the same as those shown for contacts and are taken from the contact record associated with the current lead, as previously described in Contact insights. One exception to this is the Overview tab, which also tracks lead-specific information such as the lead's age (how long the record has been active) and its progress over time. For leads associated with an account rather than a single contact, the insights combine interactions made by all contacts that belong to that account. To view segment insights, go to Marketing > Customers > Segments, select a segment record, and then open its Insights tab. Here you can see how the membership of your selected segment has changed over time. To view customer journey insights, go to Marketing > Marketing execution > Customer journeys and select a journey. Journeys show some insights on the Designer tab and others on the Insights tab. Insights are only available for customer journeys that are (or have been) live. Customer journeys provide three categories of insights: Designer, Insights > Overview and Insights > Incomplete journeys. Inflow : Shows the number of contacts who entered this tile. Processing : Shows the number of contacts that are still being processed by this tile. For example, they may be waiting on a trigger tile until the trigger condition (or timeout period) is met. Stopped : Shows the number of contacts that were stopped from continuing the journey at this tile. There are two main reasons that a contact might get stopped: they got added to the journey's suppression segment, or they lowered their consent level below the minimum threshold set for the journey. For even more information about what happened on a tile, select it from the pipeline and look at the Data panel. The information shown here depends on the tile type. Volume > Inflow: Counts how many contacts entered the tile. Volume > Processing: Counts how many contacts are still waiting for that tile to finish processing them. For trigger tiles, for example, this value indicates the number of contacts that are waiting for the trigger condition to be met or for the timeout to arrive. Volume > Stopped (only shown when stopped contacts exist): Counts the number of contacts that were stopped from continuing the journey at this tile. There are three main reasons that a contact might get stopped at a tile during a journey: they unsubscribed from the mailing list targeted by the journey, they got added to the journey's suppression segment, or they lowered their consent level below the minimum threshold set for the journey. This value is also displayed as the second value shown above the tile in the pipeline. Some tile types provide a floppy-disk button here; select this button to generate a segment that includes all contacts that were stopped at exactly this tile of this journey. You can see a detailed breakdown of which contacts stopped here and why by going to the Incomplete journeys view. Volume > Failed (only shown when failed contacts exist): Counts the number of contacts that failed to be processed by the tile, typically because of an internal error. This value is also displayed as the third value shown above the tile in the pipeline. Some tile types provide a floppy-disk button here; select this button to generate a segment that includes all contacts that failed at exactly this tile of this journey. Volume > Processed: Counts the number of contacts that were successfully processed by this tile and passed on to the appropriate next tile. Some tile types provide a floppy-disk button here; select this button to generate a segment that includes all contacts that were successfully processed by exactly this tile of this journey. This value is also displayed as the first value shown above the tile in the pipeline. KPIs: For tile types that collect key performance indicators (KPIs), such as email tiles, you can read detailed results here. For more information about many of the terms that might be shown here, see the Insights glossary. Paths: Trigger and splitter tiles include this section, which tells you how many contacts went down each available path. View details: This link is provided on the Data panel for tile types that have even more information available. Select this link to open the associated record, where you can explore its full insights panels. 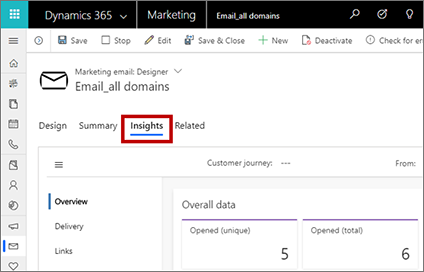 For example, email and event tiles provide this link, which opens the insights panels for the specific message or event associated with the tile. 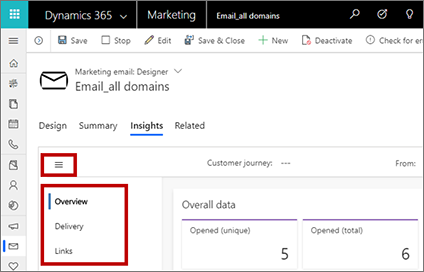 Open the Insights tab and select Overview to view basic email results, plus information about how many contacts interacted with the emails and marketing pages used by this journey. When you're analyzing the results of a customer journey, one of the most important things to find out is whether all your messages were delivered as expected—and if not, who was affected and what went wrong? Open the Insights tab and select Incomplete journeys to view each reason why a contact might fail to complete the journey and lists each contact that falls into each of these categories for the current journey. Contact joined the suppression segment: The contact joined the suppression segment for the customer journey. Select a reason in the left column of the table to see a list (in the right column) of contacts that were stopped for that reason. Contact has do-not-email set: A setting on the contact record indicates that that contact doesn't wish to receive marketing email (or any email) from your organization. Duplicate recipient address: The journey already sent the message to this email address. You probably have more than one contact record with the same email address. Recipient address isn't valid: There is something obviously wrong with the recipient address (such as no "@"), which means that the message can't be delivered. Sender address isn't valid: The email is designed with a sender address that is blank or malformed. This may affect your entire send (if you are using an invalid static address or expression), or it may affect just a few messages if you are using a dynamic expression that only fails for some contacts for which data is invalid or missing. Reply-to address isn't valid: Same as for the invalid sender address, but this applies to the reply-to field. 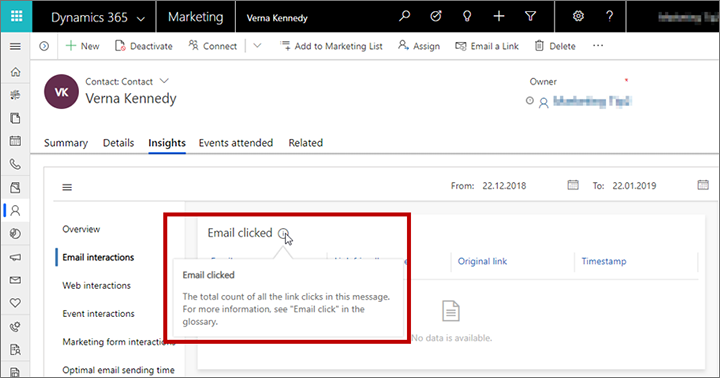 Email contains blacklisted links: Dynamics 365 for Marketing analyzes the content of outgoing messages to make sure they don't contain any blacklisted links. If one is found, the message is blocked. The system keeps an internal list of blacklisted sites that are known to be used for phishing, hosting malware, and other issues. This feature helps make sure that you don't accidentally include a link to one of those sites in your marketing messages. Contact deleted: The target segment included a contact that has since been deleted. Contact is inactive: The target segment included a contact that has been set to inactive. Select a reason in the left column of the table to see a list (in the right column) of contacts that weren't sent a message for that reason. To view email insights, go to Marketing > Marketing execution > Marketing emails, select an email message, and then open its Insights tab. Insights are only available for email messages that are (or have been) live. Here you can find a complete history of how various contacts have reacted to the selected message, which links they selected, and where they were when interacting with the message. You can also see delivery details. Because you can reuse an email message in several different journeys, the filter settings for email insights include a field for specifying which journey you would like to analyze. If you don't select a journey, then the information you see applies to all journeys where the message was used. As with most other entities, you can also filter email insights by date range. Overview: Provides a general overview that includes KPIs, top-10 links, responses over time, geographical data, and more. Delivery: Provides details about your delivery results (such as processed, delivered, blocked, or bounced), including lists of contacts affected by each type of result. There is also a table of overall results by recipient domain. Links: Provides an analysis of each link included in the message. It includes a graphical reproduction of the message that shows a heat map highlighting your links. The heat map shows a red overlay to indicate the most clicked link, and follows the spectrum down to blue, which indicates the least clicked link. Hover your mouse pointer over a link to see the number of total clicks, unique clicks, and the click-through rate (total number of unique clicks for a given link divided by the total number of unique clicks overall). Use the drop-down list at the top of the heat map to choose which KPI to use when coloring the links. All links are also listed in a table below the heat map. Interactions: Provides full lists of recipients that were counted for each of several KPIs (such as opens, clicks, and forwards), plus a timeline of interactions. For more information about the carious types of email results and KPIs listed on these pages, see Insights glossary. To view lead scoring model insights, go to Marketing > Lead management > Lead scoring models, select a model, and then open its Insights tab. Insights are only available for models that are (or have been) live. Here you can find a timeline showing the number of leads processed by the model over time. To view marketing page insights, go to Marketing > Internet marketing > Marketing pages, select a marketing page, and then open its Insights tab. Insights are only available for pages that are (or have been) live. Here you can find a complete history of how various contacts have interacted with the page and the submissions made using it. Because you can reuse each marketing page in several different journeys, the filter controls for page insights include a field for specifying which journey you would like to analyze. If you don't select a journey, then the information you see applies to all journeys where the page was used. As with most other entities, you can also filter marketing page insights by date range. Overview: Provides a general overview that includes KPIs, responses over time, geographical data, and more. Submissions: Provides a table that lists the full content of each submission made through the page. Metadata and several important field values are shown in the table columns for each submission; hover your mouse pointer over a value in the Form submissions column to open a tooltip that shows all values included in a given submission. Visits: Provides a table that lists information about each time the page was opened. To view marketing form insights, go to Marketing > Internet marketing > Marketing forms, select a form, and then open its Insights tab. Here you can find a complete history of how various contacts have interacted with the form and the submissions made using it. Although you can use each form on multiple pages and in multiple journeys, all form insights combine data from all usages, though you can still filter results by date range. Overview: Provides KPIs such as the total number of form submissions, contacts created or updated, and leads created or updated by the form. Submissions: Provides a table that lists the full content of each submission made through the form. Metadata and several important field values are shown in the table columns for each submission; hover your mouse pointer over a value in the Form submissions column to open a tooltip that shows all values included in a given submission. To view website insights, go to Marketing > Internet marketing > Websites, select a website record, and then open its Insights tab. Overview: Provides a list of the most popular website pages that include the script created and tracked by this website record, and a map that shows where people were when opening those pages. Timeline: Shows a table that provides details about each time a page that includes the script created and tracked by this website record was loaded. To view redirect URL insights, go to Marketing > Internet marketing > Redirect URLs, select a redirect URL record, and then open its Insights tab. Overview: Displays a map that shows where people were when they selected the redirected link. Timeline: Shows a table with details about each time the redirect URL was selected.